Pen Tip + Broad Tip, .88 oz., ASTM D-4236 Two glues in one! 62202 is in stock for immediate shipment. MONO� Adhesive Power Bond has an extra strong bond that firmly adheres heavyweight paper, textured cardstock and photos. 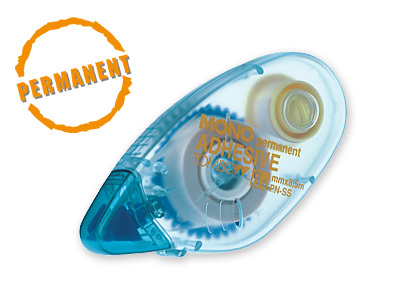 Compact applicator precisely applies film of adhesive for a permanent, instant bond that is smooth and wrinkle-free. 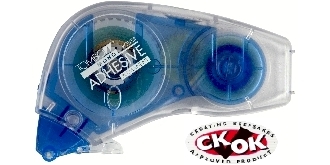 Adhesive is acid- FREE and ideal for use with memory albums and archival materials. Nonrefillable. StickiTrac� Adhesive is the quickest, easiest way to stick things together! 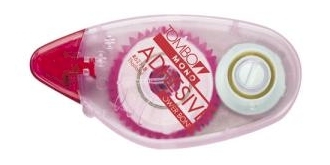 Easy to use compact applicator, applies mess- FREE strip of adhesive for an instant permanent bond. No messy liquid and no drying time! The ideal solution for crafts, gift-wrapping, scrapbooking, etc. Adhesive is smooth and wrinkle-free. Roller tip for easy application and removable protection-tip cover. Acid-free; safe for use with archival materials. MONO� Metal Glue features a super strong bond that will securely adhere metal trinkets and embellishments to paper. 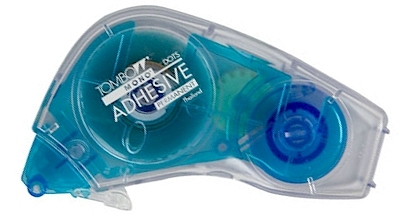 Safely glue photos, cardstock and small plastic adornments with glue that dries completely clear. Dual tip applicator features pen tip for precision gluing and brush tip for covering larger areas. Acid-free, non-toxic and washable.